The majority of supporters (95%) were in favour of including NOTA on ballot papers, so this has now become 5PM policy. PROPOSAL: Should NOTA (none of the above) be included as a voting option on ballot papers in local and central government elections, with the effect that should NOTA gain the most votes, the election nominations would be re-opened and another election held? 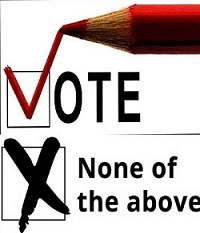 Having “None Of The Above” or NOTA on a voting paper gives voters a valid choice of expressing a no confidence vote. Not voting or invalidating the ballot paper as a protest has no effect as there are many reasons why people don’t vote or why they invalidate their vote. Politicians assume voters who don’t vote can’t be bothered doing so – they would never think that it could have anything to do with ‘their’ behaviour or performance. It is likely to increase voter participation by providing them with a clear option to express dissatisfaction. A number of countries already include NOTA as a voting option. It is a complication we don’t need. In the event that NOTA wins, another election would need to be held (in practice this is likely to be extremely rare and would only apply to electorate voting rather than the party vote).